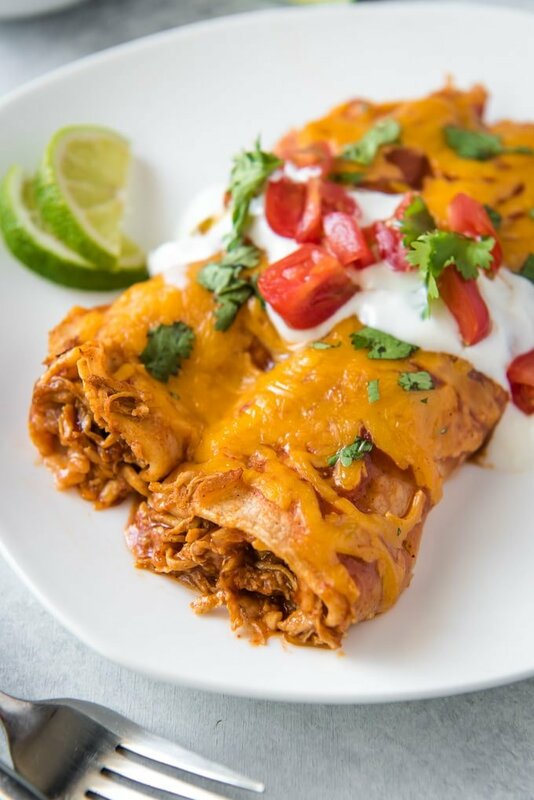 With tender chicken wrapped in corn tortillas and smothered in red sauce and cheese, you can’t go wrong with these restaurant quality chicken enchiladas! Mexican food is a staple in our home. 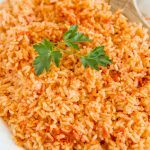 We have Slow Cooker Chicken Tacos and Authentic Mexican Rice once a week. 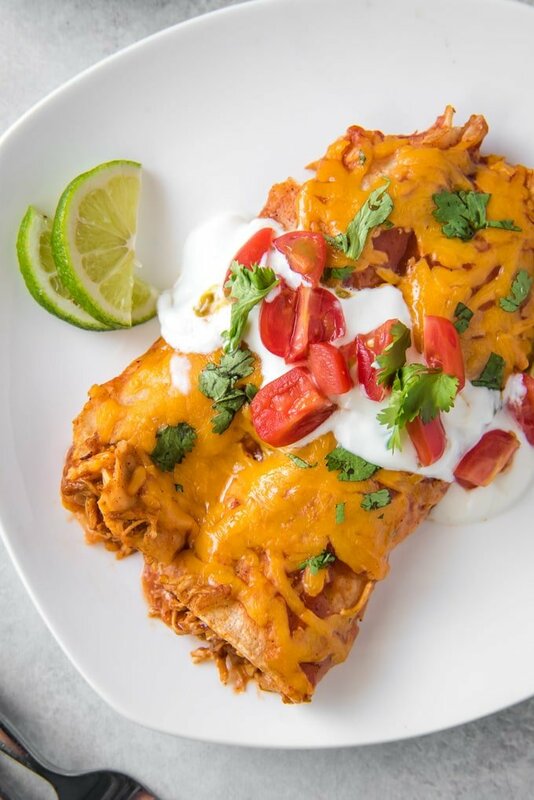 These chicken enchiladas have recently made it into the monthly rotation and I couldn’t be happier. Making enchiladas always seemed like such a daunting task so it wasn’t something I was eager to do. But in reality they really are pretty simple and just take about 15 minutes of prep. They can be made with either a green or red sauce and any kind of melty cheese. This recipe comes from my sister’s mother-in-law, with the biggest difference being that I left out the lard. I just couldn’t do it you guys! So instead of frying the tortillas in lard or even oil, I just microwave them to soften them and make them pliable and ready to roll. 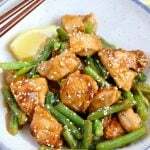 This recipes anticipates that you have shredded chicken on hand. 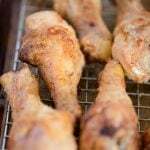 You can use a store-bought rotisserie chicken, or make shredded chicken in bulk using my slow cooker or instant pot methods. Start by cooking some diced onion in a large skillet. Add some pre-cooked chicken, garlic and taco seasoning and let it cook for a couple of minutes. Mix in some red enchilada sauce, chicken broth and lime juice. We love our Mexican food seasoned with lime but you could leave it out if you’re not a fan. 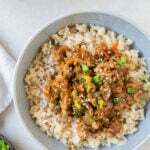 It gives a nice acidic bite that cuts through the richness of the sauce. Simmer this mixture for several minutes so the chicken can absorb the flavors. 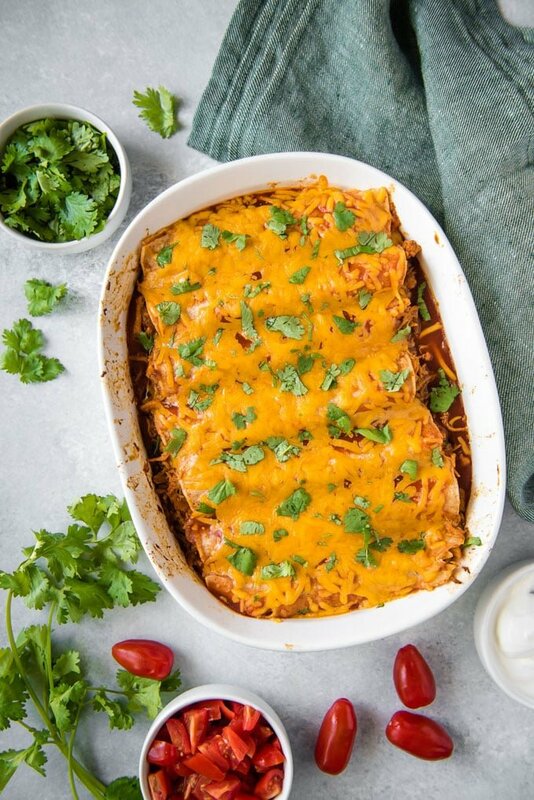 Add some enchilada sauce to the bottom of a 13×9-inch baking dish and spread it evenly to coat. Dip a corn tortilla in some enchilada sauce and spread some of the chicken mixture down the center. Top with a little bit of cheese and then roll it up. Place enchiladas seam side down in the pan. *Pro tip: heat the corn tortillas for about 30 seconds in the microwave to soften them and make them pliable so they don’t tear. Pour the remaining sauce over the chicken enchiladas and top with cheese. 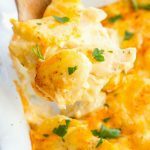 Bake for 15-20 minutes or until the cheese is melted and bubbly. 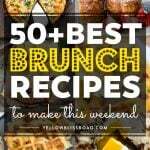 Garnish with your favorite toppings, like sour cream, diced tomatoes, cilantro and avocado. How do you soften corn tortillas without frying them? As you can see in the recipe below, I do not fry my tortillas when I make enchiladas. It’s an extra that I can just do without. Place a stack of tortillas in the microwave for about 30 seconds and they will be pliable enough so they don’t split with the weight of the filling. If you would like to fry your tortillas, you can do so by heating an inch or so of vegetable oil in a large skillet over medium-high heat and frying the tortillas in the hot oil for 10-20 seconds per side. Drain on paper towels. 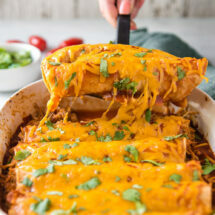 Do you use corn or flour tortillas for enchiladas? Corn tortillas are traditionally used to make chicken enchiladas, but flour can also be used. I recommend corn, however, as they tend to stand up much better while flour can get a little mushy. Yes and no. If you’d like to freeze your enchiladas, I recommend doing so without the cheese and sauce toppings. 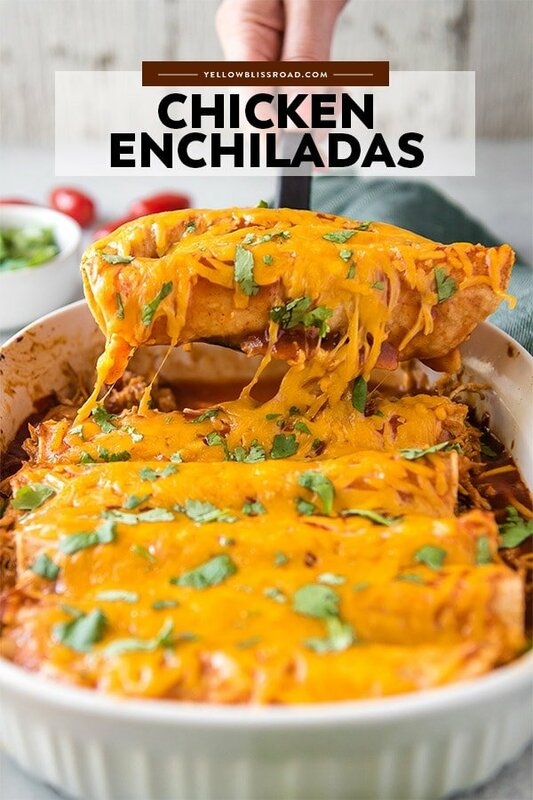 You can prepare the enchiladas rolled up, then freeze them in a pan or on a tray. Once frozen wrap them up and place portions in a freezer bag. The sauce tend to separate when frozen, and the cheese doesn’t brown up as it would if fresh. 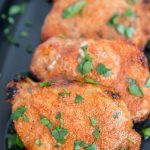 When you’re ready to bake them, add sauce and cheese and bake as the recipe calls for, adding 10 minutes to the time to allow for defrosting. If you have leftovers, store them in an airtight container in the fridge for up to 3 days and reheat in the oven or microwave. 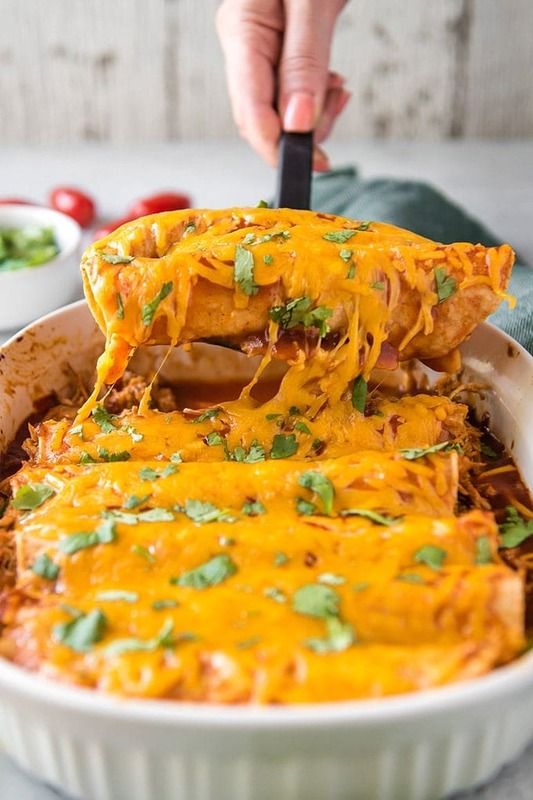 With tender chicken wrapped in corn tortillas and smothered in red sauce and cheese, you can't go wrong with these restaurant quality chicken enchiladas! Melt butter and 1 tablespoon olive oil in a large saute pan over medium heat. Add onions and cook until translucent. Stir in chicken, garlic and taco seasoning and cook for 1-2 minutes. Stir in ½ cup of enchilada sauce, ⅓ cup chicken broth and lime juice. Simmer for about 5-7 minutes. Preheat oven to 350 degrees F. Spray a large baking dish (9”x13”) with nonstick cooking spray. Spoon about a ½ cup of enchilada sauce into the baking dish and spread to coat evenly. Microwave tortillas for about 30 seconds to soften. Dip each tortilla in enchilada sauce to lightly coat. Spoon ¼ cup of the chicken mixture down the center of each tortilla. 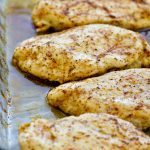 Sprinkle about a tablespoon of cheese over the chicken. Roll and place seam side down into the baking dish. Pour remaining enchilada sauce over the enchiladas . Top with remaining cheese. Bake uncovered for 15 minutes, or until cheese is melted and bubbly.